Jakarta Transportation Dept. (Dishub) will implement traffic engineering on Jl. Jenderal Sudirman. It is done to follow up revitalization on three pedestrian bridges (JPO)s on the location.
" 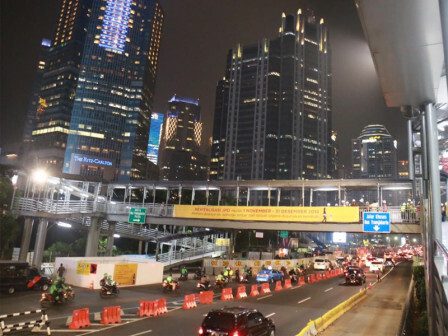 During revitalization, we suggest road users to avoid those roads"
Jakarta Dishub Acting Head, Sigit Wijatmoko stated, his party revitalizes Bundaran Senayan JPO, Gelora Bung Karno (GBK) JPO, and Polda Metro Jaya JPO. "Revitalization is run from November 1 to December 31, 2018," he informed, Thursday (11/1). According to schedule, Polda Metro Jaya JPO is dismantled on November 1, Bundaran Senayan JPO on November 4, and GBK JPO on November 16. Next, materials to build those three JPOs will be installed in turns on November 11, 15, and 27. In order to ensure traffic runs smoothly during construction, his party will implement traffic engineering on Jl. Jenderal Sudirman from 10 PM to 5 AM. It is done because two road lanes will be closed while JPOs are dismantled and re-constructed. During revitalization on Polda Metro jaya and Bundaran Senayan JPOs, crossing access for Transjakarta passengers will be directed to use JPO at GBK Shelter. When GBK JPO is dismantled, Transjakarta passenger will be directed to use pelican crossing on the south side of shelter. "During revitalization, we suggest road users to avoid those roads and follow the prevailing traffic arrangements, traffic signs, instructions from officer on the field and always prioritizing safety on the road," he asserted.